The Scissor / Claw Mole Trap is a traditional type of trap for catching, trapping, killing and getting rid of problem moles in the garden. Scissor / Claw Mole Traps are easy to set in a mole hill or mole tunnel. The handle ends of the trap are left showing above ground and these then spring apart when you have a mole catch. 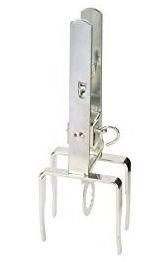 Scissor / Claw Mole Traps are very effective and are used by professional pest control companies and professional mole catchers.